These are some of my favorite outfit photos I’ve ever done! I love these metallic culottes beyond all reason. They are such a great way to update your wardrobe and feel brighter and bolder. 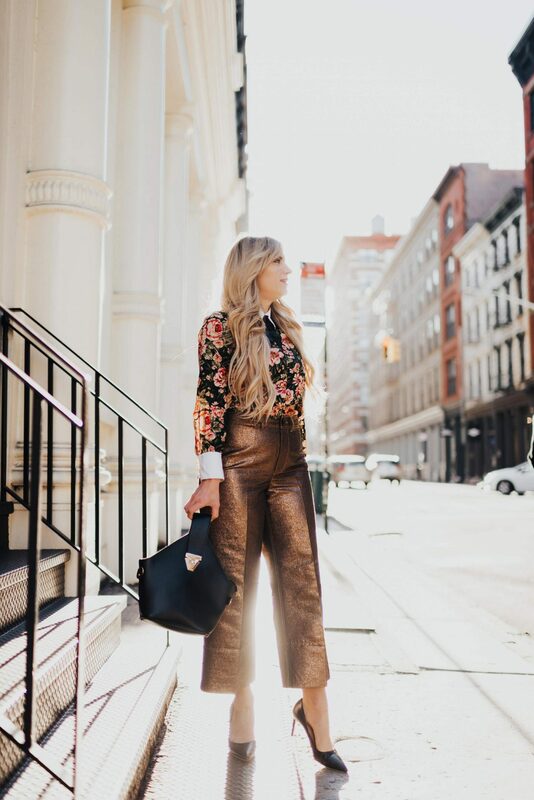 Right now, these metallic culottes are on massive sale: making them under $50! These photos are the final outfit photos I shot while in New York last month. I love the metallic & floral combo. 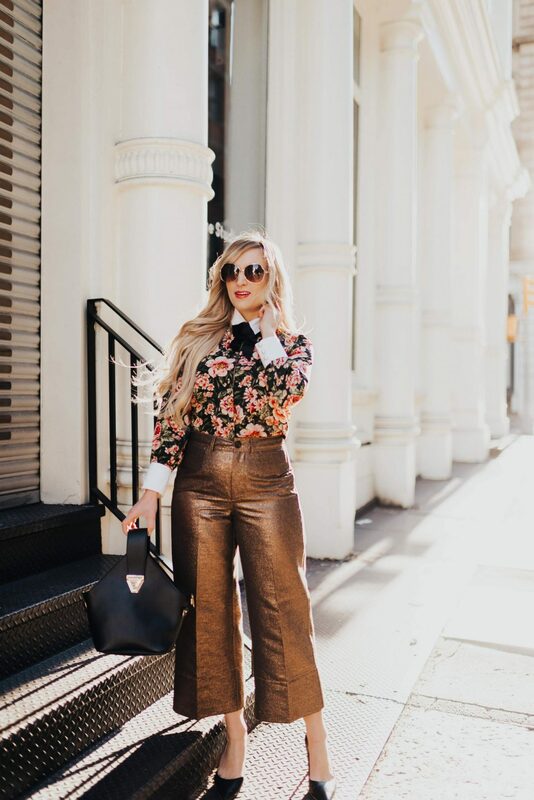 The metallic culottes are a more tomboy / masculine piece and pairing them with florals is such a fun contrast, and easy way to make a stand-out outfit! 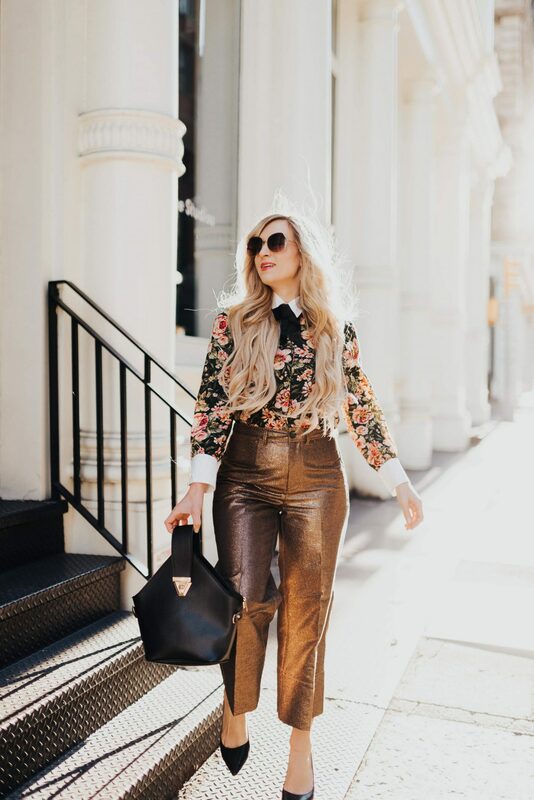 My floral top is a few seasons old, but any floral blouse would work to re-create this sort of look. On instagram this week I shared a photo as a “get to know me post” because I’ve gained some new followers recently. I was pretty surprised by the response, as a lot of people said that they liked getting to know more about me and wanted to know more. So today, I thought I would take this opportunity to share 10 things you didn’t know about me. 2. I can’t stand the taste of water. People swear it doesn’t have a taste, but it does to me. I hate it! I have to force myself to drink at least a few glasses a day. 3. My two favorite types of food are Mexican & Thai. I could live off chips & salsa or veggie stir fry. 4. I still have my childhood stuffed animal. It’s a tabby cat I was given by my great grandmother (I think? ), shortly after I was born. I slept with her for years, and now she lives on my bookshelf. 6. I don’t consider myself the strongest academic, but I do really well with standardized testing. I got in the 99.9 percentile on the LSAT. My brain has always liked the order & structure of standardized testing I think! 8. My two closest friends, Maddie & Sarah, mean everything to me. Having been through the ending of a decade long relationship and then years of dating since that, having always had Maddie & Sarah by my side has been invaluable. Maddie and I have been best friends since the 8th grade, and Sarah is my sorority little sister (Delta Gamma!) who I met in 3rd year university. Neither of them live here so I am an expert now at the long-distance friendship thing lol. 10. I grew up loving musical theatre. One of my earliest memories is belting out “Do you hear the people sing” from Les Miserables while in the car with my mom. 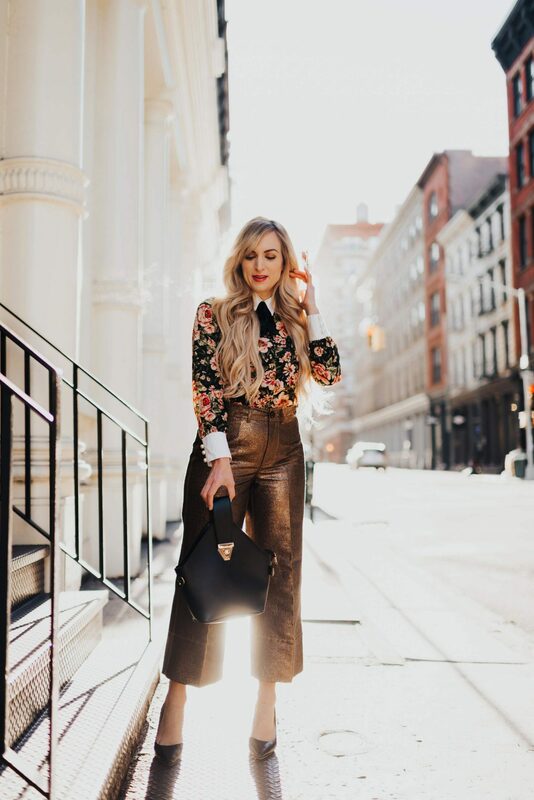 "Spring Work Wear 10 x 10 and a Nordstrom Giveaway!" Ok this whole look is SO fabulous!! You are killin it girl!! Ah I always name my zits. They’re usually called Jamal. Or Bob. Love this bag! Hahaha that’s hilarious! love it! Thank you! And ahh love it! Musical theatre nerds unite! 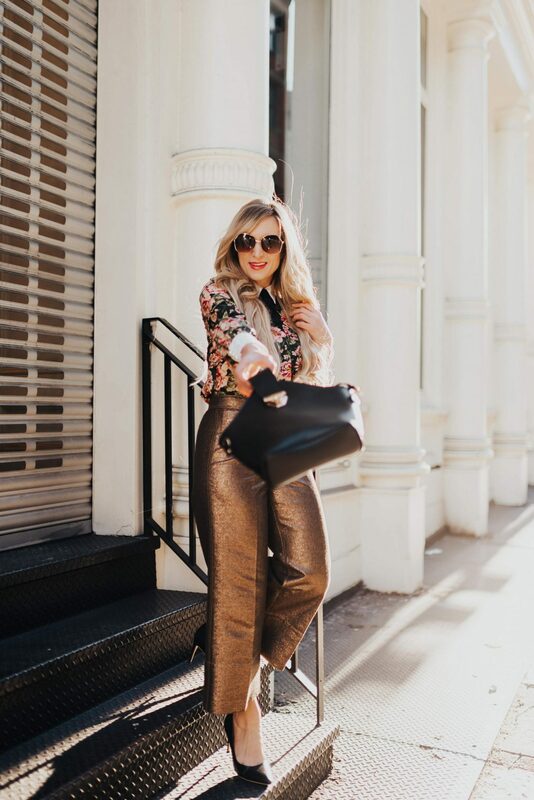 Love everything about this outfit and you are totally rockin these metallic culottes! So cute and chic! These pants are so cute! I love this style of post! I am a chips & salsa girl too! Haven’t tried Thai food yet! Thank you so much! And oh girrrrl, you gotta get on Thai food! Its amazing! Wow these pants are unique. Not sure if I could wear them. But you are definitely rockin’ them. Thank you!! They are definitely a bold choice- but I’ve found them surprisingly versatile and easy to wear. Theyre great with a baggy v-neck white tee tucked in and equally good dressed up like I’ve done here! My first job was a dance teacher as well!! And I too could live off of chips and salsa .. this post ((and those pants!)) is so fun! Ah no way!! I love it! What dance did you do?? I did ballet, jazz, tap and hiphop! 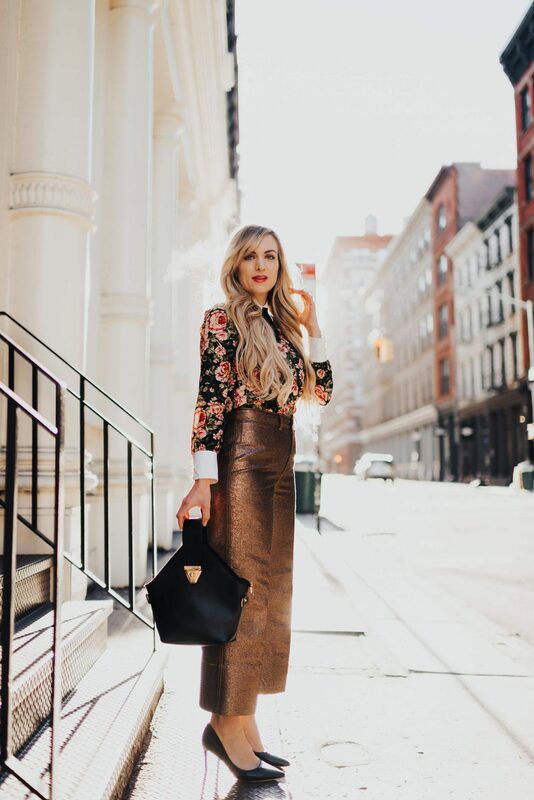 This metallic and floral combo is everything! So pretty! its love i never seen a thing such like that. Where is this shirt from?! I am OBSESSED. Thank you!! Unfortunately it’s really old – it’s from Zara about 3-4 years ago!